the earliest know examples dating to around 650 AD. These early designs were etched on face of a slab of rock much like you would find on a grave stone. It wasn't until the 9th century that the chiseled monuments, that are often referred to as the High Cross, came into being. The trend of these Celtic crosses, with recorded heights of 23 feet, continued in Ireland, along with the surrounding islands that were evangelized by the Irish, through the 12th century. These early Celtic crosses were often found at churchyards and are self-contained monuments that were generally sculptured form sandstone. Some were simple designs, while others, such as the Cross of Scriptures at Clonmacnoise and the High cross at Monasterboice, featured ornate figure carving, but the chief characteristic feature is the circle connecting the arm and the stem. There is much speculation as to why the circle or ring was added to what became to be known the Celtic cross. The theories and legends ascribed to the adaption range from spiritual to artistic and even consider structural implications. One popular legends includes that St. Patrick came upon a standing stone that was carved with a circle, the symbol of the pagan moon goddess. 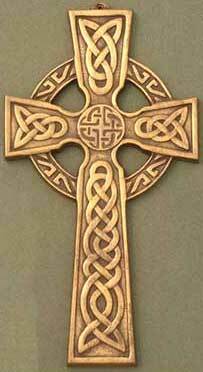 St. Patrick blessed the stone and added a Latin cross to the design and thus created the first Celtic cross. Another legend, again has St. Patrick, but this version it is the sun, a symbol of both light and life, as the circle that is combined with the Latin cross to create the Celtic cross. Metaphorically, the sun, which was worshiped by the pagan Irish, is replace with Jesus Christ, the Son of God. Regardless of which legend is correct the Celtic cross has evolved into a deep-rooted Christian icon that is historically connected to Ireland in the form of these ancient stone carvings. The Celtic cross remains a popular symbol of faith and heritage as it continues to be use as grave stones and jewelry along with gift items and as tattoo designs. The Irish Gift House can't help you with grave stones and our assistance with tattoos would be limited to that you are welcome to barrow any of our product designs as inspiration for your body art; however if you are looking for Celtic wall crosses or a sterling silver Celtic cross necklace you will hit the jackpot by visiting our site. Additionally, we have a huge selection of Celtic cross necklaces for men along with gold Celtic cross necklaces. You will find all of these selections, along with nine additionally categories, under our Celtic crosses index heading on our site.